Several days ago, I came across a news report of two videos released by the Ukrainian Informational Resistance channel on YouTube on the occasion of the 70th anniversary of the victory of the Soviet Union in WWII. 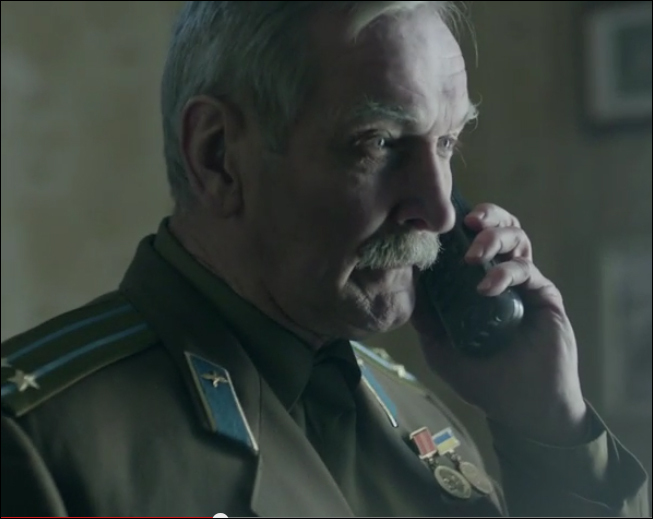 The first video features a ‘ded’ (meaning, in Russian, an old man or grandfather). He is a Soviet veteran dressed in military uniform, decorated with WWII honours. He is looking at himself in a mirror, preparing for a Victory Day (May 9) anniversary march. A phone rings. It’s his grandson calling, a young Ukrainian army conscript who, as the viewer can guess from the video, is serving in eastern Ukraine, in the so-called ‘Anti-Terrorist Operation’ of the Kyiv government and army. Like the grandfather depicted, the grandson is wearing a Red Star in the left pocket of his shirt, close to his heart. The young soldier congratulates his grandfather on Victory Day. And his grandfather answers with words that are totally implausible for a veteran of the Soviet army: “Glory to Ukraine”. In the second video, an elderly lady, a grandmother (a ‘babushka’), is dressed in a jacket, also bedecked with the insignia of the Great Patriotic War (as World War Two was termed in the Soviet Union and remains so in present-day Russia). She is sitting at a table with tea service set out, looking at a photo in an album. In the photo are five nurses, five combat friends who had served together in the fields of the Great Patriotic War. A telephone rings. It is a granddaughter phoning from the corridor of a hospital. She is dressed in a white uniform. On her wrist is a blue and yellow elastic band, the colors of the Ukrainian national flag. She calls to congratulate her grandmother on Victory Day. And the grandmother answers, again, in words unimaginable for a Soviet veteran: “Glory to the heroes”. After these words, the video switches to the granddaughter rushing to a gurney on which a modern “hero”, a soldier, who, as the viewer can guess, was wounded in the ‘ATO’, is being transported somewhere. Both videos are in Russian, accompanied by Ukrainian subtitles. They were made by a “leading agency of the Ukrainian advertisement market”, TABASCO, and by a “leading film production company” in Ukraine, Limelite Studio. The film studio says it allocated “colossal” resources to shoot these videos. Both companies absorbed the costs of production so as not to charge the Ukrainian state for these patriotic public awareness clips. The general producer of Limelite Studio, Vladimir Yatsenko, explains that the entire film crew declined to be paid any royalties. “I am glad that there are so many patriots in our country, ready to do all they can for the victory of Ukraine”, said Yatsenko. The “creative” director of TABASCO, Alexander Smirnov, stated that the two videos are part of a “public awareness” campaign, a task that “social communications” outfits like his should perform in order to form society’s notions of what is good and what is bad. TABASCO says its mission is to explain to Ukrainians that “to congratulate veterans for their holiday is good and to keep family traditions is good”. TABASCO is helping Ukrainians “to find words that help two completely different generations of Ukrainians to understand each other and to defend together the future of a unified Ukraine”. An advertisement agency seeking to instill in people its own understanding of what is right and what is wrong is, indeed, conducting a campaign. But this is not a “public awareness” campaign. It is a propaganda campaign which seeks to create a myth of a “unified Ukraine”, moreover, a myth which goes totally against the historical truth, against the still living, collective memory of Ukrainians who fought in the Great Patriotic War. Not in a thousand years would those who fought in that war against the German Nazis and the collaborators of the Organization of Ukrainian Nationalists (OUN) and Ukrainian Insurgent Army (UPA) greet their children or grandchildren with the OUN-UPA slogans: “Glory to Ukraine”, “Glory to the heroes”. The authors of these two patriotic videos also brushed aside a biological truth – veterans in these two videos would have to be at least 90 years old to have participated as young adults in World War Two. In the videos, they look younger. This reminds me of unnaturally young grandmothers in Hollywood movies, who look more like the mothers of their grandchildren. In my mind, I have always compared implausible, forever-young American grandmothers in the movies to the Ukrainian and Russian ‘babushki’ I have known, worn down by long, eight-hour days of work followed by never-ending chores in caring for their families and homes. American grandmothers looked so much more glamorous and young! The fantasy world of post-Euromaidan Ukraine now has Soviet war veterans voicing the nationalist slogans “Glory to Ukraine” and “Glory to the heroes”. I wonder what real veterans, so few of whom are now left, are thinking when they hear these slogans being spouted in imaginary conversations in the videos? These “public awareness” videos are not about history. The author of the news article from which I first learned about the videos is correct: those who produced them were advised not by historians but by specialists “on how to influence mass consciousness”. When one looks on the websites of the two Ukrainian companies which produced the videos, the first thing that catches the eye is that both have worked almost exclusively with Western partners. In both companies, the majority of workers are young and Russian-speaking Ukrainians. Both websites are in Russian and English only – no Ukrainian. These are professionals working with Western partners. They have learned how to appeal to the public, how to sell a message to an audience by enveloping it in an aesthetically appealing form. But their message is based on half-truths, which makes it all the more appealing. These young Russian-speaking Ukrainians grew up in independent Ukraine and were taught a nationalist, Ukrainian version of history. Most probably, they genuinely believe what they were taught. They believe that a civil war, provoked by the Euromaidan regime in Kyiv, has a symbolic continuity with the Great Patriotic War which their ancestors won 70 years ago. Why do they believe this? Well, because almost all of Ukrainian media are saying that Ukraine is fighting a war with Russia, against ‘Putler’s Rashists’ (‘Putler’ as in Putin+Hitler). Somehow, simple logic does not enter in their minds: if Russia truly invaded Donbas or anywhere else in Ukraine, such a war would be over in a matter of days. But I digress. I do not wish to go over all of these arguments about Russia’s supposed invasion of Ukraine again. This is not the point of this article. My point is the usage of the symbolism of the Great Patriotic War, which is now playing a fundamental role in the civil war in Ukraine. Pro-Europe Ukraine tries to transform the Soviet victory in the Great Patriotic War, which is one of the foundations of Russian and Eastern-Ukrainian identity, into a universal, pan-European tragedy, in which Ukrainians triumphed over the Nazis. A short text, accompanying the two videos on YouTube, presents all Ukrainians as fighters against fascists. The irreconcilable, ideological differences between the descendants of Soviet Ukrainians, on the one hand, and those of the virulently anti-Soviet, collaborationist Ukrainians of the OUN-UPA, on the other, are glossed over in an overtly mendacious statement that all of them contributed to the great victory. The collaborationism of the OUN-UPA with Nazi Germany is a well-known historical fact; I will not dwell on it. Here are compelling statistics cited in the above-mentioned text: there were seven million(!) Ukrainians who fought in the Soviet Army and only 100,000 who fought in the OUN. That says it all about the contribution of each part of Ukraine to victory in WWII. I have written in my previous article about the losses of Soviet Ukraine in WWII. According to Ukrainian historians, eight million civilians died in the war and over 2.5 million soldiers. For these soldiers it was a war against fascist invaders. There was a genuine patriotic drive, which is impossible to negate even in the most nationalistic version of history. The reality is too powerful to forget and to alter. And it is so unwise on the part of the current rulers and masters of Ukraine to twist in such perverted logic the Great Patriotic War into an image of a common war of Soviet Ukraine and UPA-OUN Nazi collaborationists against Hitler’s Germany. Or even worse, to make the collaborationists the finest heroes of that war. Ukrainians fought alongside Russians, Byelorussians, Kazakhs and countless other nationalities of the Soviet Union. The memory of this common fight is too strong to be suppressed. The sense of pride in this victory is too powerful to forget. Even those Ukrainians who are today blinded by nationalist propaganda feel it. Their media is telling them that today Russia has invaded Ukraine. This creates a confused reaction, that modern-day Russia has betrayed them. That is why so many Russian-speaking Ukrainians are expressing such deep resentment towards Russians. What can be more painful than the treachery of a brother? The “public awareness” videos are a telling example of how propaganda works and of the feelings it generates. Of course, all of this can be interpreted as a product of Western-inspired and financed “zombying”, to use a term popular on both sides of the armed conflict in Ukraine. This “zombying” technique is a very powerful tool. Every time I read Ukrainian media, I feel like a fool – why on Earth do I refuse to believe that Russian troops are stationed in Ukraine? It takes an effort on my part to dissipate the doubts by reminding myself that I have not seen any credible proof of Russian military presence in Ukraine – only some unclear pictures from a satellite, taken not by American intelligence but by some private agencies, some postings on social media, and some videos from second-rate websites. People who believe the Western version of events tell me this is a “hybrid” war. Such warfare consists of blatant lying and telling of half-truths. We are told that Russia has been doing this masterfully since it annexed Crimea in March of 2014. For those who spout such theories, I have one question: was U.S. Secretary of State Colin Powell telling the truth when he presented before the United Nations General Assembly and the entire world on February 5, 2003 fake evidence of a mobile biological weapons laboratory in Iraq? Canada, France, Germany and Russia did not accept this as a credible proof and did not join the U.S. war then in preparation. On 15 February 2003, between six and ten million people in over 800 cities around the globe took to the streets to protest against U.S. plans to invade Iraq. It was the largest protest in human history, according to theGuinness Book of World Records. In spite of this strong international opposition, the American military monster went ahead and on March 20 of the same year, attacked Iraq. The war lasted for 8 years and it cost the lives of nearly half a million people. Because of this war and many others like it waged by the United States in the name of a famous democracy and human rights, the U.S. and its allies are not exactly in a position to teach lessons of moral behavior to Russia. International politics is a dirty game. I do not blame Russia when it chooses to defend ethnic Russians and Russian-speaking Ukrainians in the Donbas region of Ukraine. On the contrary, I believe that the struggle in Donbas is one of legitimate defense. Yes, Russian volunteers do find their way across the Ukraine-Russia border to fight in the Donbas insurgency. I have little doubt that weapons, too, filter through. But this is no more illegal than the training camps for Ukrainian far-right paramilitary groups operating in Poland and the Baltic states, the assistance provided by the CIA to managing the Security Service of Ukraine, the billions of dollars of Western money spent on ‘democracy promotion’ in Ukraine during the past 25 years, and now the training camps of the U.S., UK and Canadian militaries in western Ukraine. What is utterly illegal to me is the war itself, the so-called anti-terrorist operation that Kyiv launched against the people of Donbas with the support of the U.S. and NATO. Donbas did not start the war, Kyiv did. And now the pro-U.S. regime in Kyiv is trying to mutilate the essence of Ukraine by rewriting history, by distorting the memory of the Great Patriotic War. They want to send to oblivion the true celebration of Victory Day on May 9 and instead convert it into the sanitized, “European” way of commemorating WWII, including replacing the profoundly symbolic St. George’s ribbon with the poppy! There is one fundamental problem with this plan. Europe did not defeat the Nazis, the Soviet Union did. The Soviet people have been celebrating that great victory for many decades now. This is a genuinely popular holiday throughout South-Eastern Ukraine, as it is throughout Russia. Even Petro Poroshenko, in his lackey effort to resemble Europeans, understands that. He did not cancel May 9 celebrations in Ukraine. He went on to state that while he acknowledges that people in Lviv and people in Kharkiv will celebrate May 9 in different ways, it does not mean that Ukraine is split. Poroshenko is living in an imaginary reality. Ukraine is deeply and profoundly split by the actions of his government and its allies. The war in Donbas is in-your-face proof of that. The red poppy which the new Kyiv regime is trying to graft upon the commemoration of the Great Victory will have a very hard time taking root in South-Eastern Ukraine, in Donbas in particular. The St. George’s ribbon can be seen everywhere in Donbas. For the Donbas insurgency, their fight against the Kyiv “junta” is a continuation of the fight of their grandfathers and great-grandfathers against Nazi Germany. During our press-tour in Donbas in April, one of the deputies of the Novorossiya parliament showed me the grave of an unknown member of the Donetsk insurgency who died from a Ukrainian shell. He was buried close to the monument to the victory in the Great Patriotic War. On May 9, there will be military parades in Donetsk and Lugansk. In Kharkiv and Odessa, Zaporizzhia and Kherson, celebrations will take place that day to commemorate the day of Victory in the Great Patriotic War. In Lviv, Ukrainians will mark the moment as a time of remembrance and reconciliation for those who lost their lives. All this is perfectly fine in a democratic country. Everyone should be free to celebrate in a way which reflects their beliefs and values. But in post-Euromaidan Ukraine, the nationalist Kyiv regime is seeking to prevent Ukrainians from honoring the victory of their grandfathers. In Kharkiv, to take one example, it has been declared that anyone wearing a St. George’s ribbon will be searched by the police and checked for suspected ties with the Donetsk and Lugansk People’s Republics. In Odessa recently, an employee of the Minister of Interior of Ukraine was detained by Right Sector gunmen because he had a St. George ribbons and a flag of the Russian Federation in his car. How can Victory Day be celebrated in such an atmosphere of intimidation and fear? The man in Odessa was detained by illegal gunmen because the St. George ribbon is considered the symbol of an “aggressor country”. The current Kyiv regime is exploiting the symbolism of the Great Patriotic war in a perverted way, presenting the current civil war in Ukraine as a war against a non-existent Russian aggressor. This “official” ideology is part of a real, not fictitious, hybrid war that the bankrupt regime is waging against its own people. I have a firm belief that one day my people, Ukrainian people, so many of whom are presently blinded by official propaganda, will wake up and see who is now presiding in Kyiv, will see all these lies. They will remember who they are, will remember the great victory that they fought for side-by-side with Russians. I am pleased to see there are important signs of a growing awakening. Memory is powerful. It emerges from under the lies and half-truths. And it will return to Ukrainians, no matter how hard the current Western lackeys who now sit in Kyiv try to suppress it. It will re-emerge, like the memory of KGB killings and Soviet deportations of Western Ukrainians in 1939-1948. It will come back because it is rooted in truth, and truth always prevails. It is stronger than time, than propaganda, than denial. And on that day, the Donetsk guys fighting on the “Ukrainian” side will hug the Donetsk guys fighting for the insurgency. And this horrible, fratricidal war will be over.